Wireless access control systems are taking the world by storm, making it possible to install systems in existing buildings at a fraction of the cost of traditional wired systems. 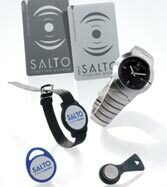 Northside Locksmiths can design, install and maintain your wireless access control system, using the latest components from the worlds leading manufacturers like SALTO and Kaba. Our state-of-the-art electronic locking systems offer flexible and functional access control with a wide choice of software options. Our access control systems are designed to work in a wire free environment so there is no need to hard wire the building, allowing you to keep your original doors and locks in place. This makes installation fast, self contained and straightforward. An access control system that uses distributed intelligence in both the lock and the key to communicate wirelessly with PC based SALTO programming software that makes lock re-programming or re-keying a thing of the past. The new E-Plex by Kaba combines the strength, simplicity and reliability of the industry leading Simplex® locks with the enhanced security and convenience of electronic access control.